Ngorongoro is the second largest extinct crater in world, and has a spectacular concentration of wild life. The Serengeti hosts the largest terrestrial mammal migration in the world, which helps secure it as one of the Seven Natural Wonders of Africa, and one of the ten natural travel wonders of the world. The Serengeti is also renowned for its large lion population and is one of the best places to observe prides in their natural environment. Reach airport in time to take your Kenya Airways flight to Mt. Kilimanjaro via Nairobi. On arrival pick up and transfer to Ngorongoro Serena Lodge with lunch en-route at Arusha. Stay full board. After breakfast depart for a full day Crater game drive with picnic lunch. Full day Crater game drive with picnic lunch. Return to your lodge for overnight stay. Stay full board. After breakfast, check out and drive to Serengeti. Carry picnic lunch, en-route you will visit the Olduvai Gorge. Stay at Serengeti Serena Lodge on full board basis. After breakfast, set our with picnic lunch for full day game drive in the Serengeti. You will visit places which are known for Migration of animals. You can also visit the native settlement, which is optional activity with payment on spot. Stay at Serengeti Serena Lodge on full board basis. After morning game drive you will be transferred to the airstrip for flight to Arusha. Pick up and transfer to your lodge for overnight stay. Stay on full board basis. After breakfast transfer to airport for flight back home. 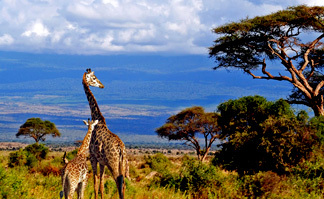 Village visit in Serengeti – US$ 20.00 to US $ 25.00 per person to be paid on spot.